On Monday VicForests’ logging contractors were INSIDE a protected National Site of Significance for Rainforest. A small group of protesters had been holding up logging since last Thursday (8th Dec). The blockade was broken up Monday. 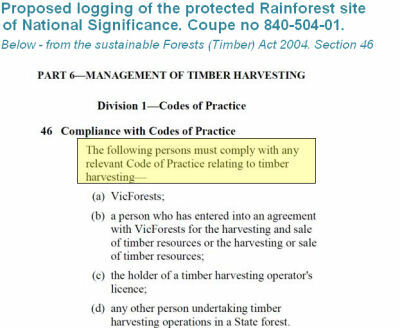 This government run logging monopoly called VicForests is again forcing ordinary people to take legal action to stop this criminal activity of rainforest logging in our own state forests! URGENT !!! Call for help! VicForests’ logging contractors are currently INSIDE a protected National Site of Significance for Rainforest. A small group of protesters have been holding up logging since last Thursday. The blockade was broken up today. We haven’t heard back from any of the protesters yet. This could be the start of another court injunction! 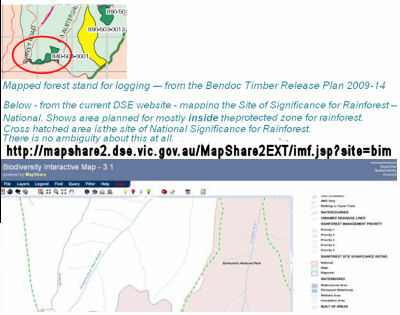 · On the 23rd Nov, Environment East Gippsland sent a letter to the DSE alerting it to the planned logging of a protected National Rainforest Site of Significance (the stand of forest had been tagged out in readiness for logging). No reply was received. · During the week of the 7th December, VicForests contractors pushed a logging road and log landing into the site which adjoins the Errinundra National Park. · On the evening of 7th December, protesters cabled a tree sit to 4 bulldozers, effectively halting all logging at the site. · On Thursday 8th, our lawyers sent a letter to VicForests warning them they were inside a protected area and to respond by the end of the day as to whether they would be removing the logging machinery. There was no response. · Our lawyers then sent a second letter on Friday 9th Dec, warning them that should logging proceed, they would seek instruction from Environment East Gippsland regarding an urgent injunction to stop the damage to this protected area of forest. There was again, no response. 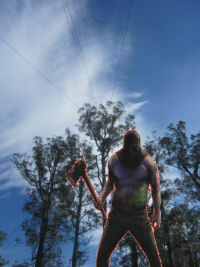 · Monday 12th December, police and state forest and logging agencies cleared the area of protesters and two tree sits. There was one arrest as a result of the police using sniffer dogs! · Monday – we also sent an urgent letter off to the Snr Sgt at Orbost Police Station detailing the illegal nature of the logging, complete with maps and sections of the relevant Acts and Code - see below (hope the images transfer OK). We asked that they refrain from arresting those trying to uphold the law. And if there are people proceeding to damage the protected site, that they enforce the laws and notify the logging contractors and VicForests of the illegality of logging and if necessary arrest them. This request is at least on the record. We are now being forced to apply to the Supreme Court for an urgent injunction. Environment East Gippsland has set a precedent for this by successfully suing VicForests last year over plans to log threatened species habitat. We have already established standing, and other precedents. 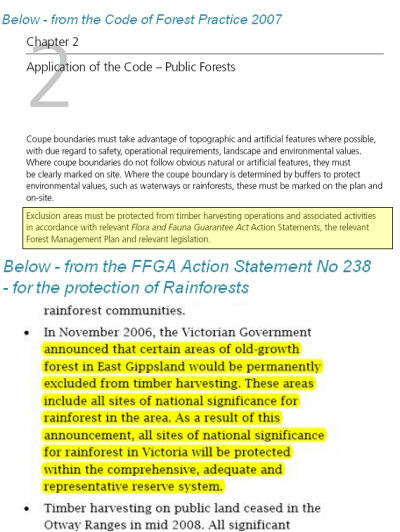 BUT ... despite the Supreme Court ordering VicForests to pay 90% of our legal costs (in August 2010), VF is still refusing. This means another trip back to the court to force them to pay up! So despite having the standing and ability to take court action against VicForests again, we are unable to due to lack of funds. Our lawyers will do their best to keep costs down but even just filing court papers can cost maybe $3,000. We are intending to get this done by Wed morning thanks to a super human effort of our lawyers. We are asking a range of people and supporters to help get the ball rolling and force VicForests to adhere to the law that protects Rainforest Sites Of Significance. But most are in the same boat as us. Can you please help at all – in any way? Donations or people willing to come to the site and help until an injunction can be secured. Environment East Gippsland has tax deductible status so can issue tax receipts for donations. We imagine the urgent filing of papers to the court could take about $3,000. Once kick-started, the court case itself could put costs up to $10,000. Much cheaper this time, but still money we don’t currently have. Our bank details can be sent upon request if you’d like to donate via EFT, or just go to www.eastgippsland.net.au and donate via the Paypal button. We would appreciate any help – financially or just in spreading this through your networks. Below are the legal details of what is going on.